Cabrillo High School has earned a Linked Learning Gold Certification for a specialized academic and career pathway. The honor for the Cabrillo Academy of Law and Justice (CALJ) is the first of its kind for a large, comprehensive high school in the Long Beach Unified School District. Linked Learning pathways combine challenging academics, demanding technical courses, and work-based learning focused on an industry theme. The certification by independent reviewers affirms the high quality of the Cabrillo pathway’s college and career preparation offerings. CALJ helps students to explore public service careers, with a strong focus on legal studies and criminal justice. The pathway earned the recent honor after its educators participated in a Gold Certification pilot effort. “CALJ faculty is to be commended for their strong collaborative work in developing a strong college and career program for their students. The four-year program of study, that includes well integrated work-based learning experiences, builds through the students’ four years,” reviewers from the Linked Learning Alliance stated in their certification report. The alliance is a statewide coalition of education, industry and community organizations dedicated to improving California's high schools and preparing students for success in college, career and life. McBride High School, one of LBUSD’s smaller thematic high schools, also recently earned the Gold Certification. “One thing that was consistent across all (winning) pathways was the laser focus on self-improvement and on creating high-quality learning experiences for students,” said Dan Storz, a senior director with the Linked Learning Alliance. 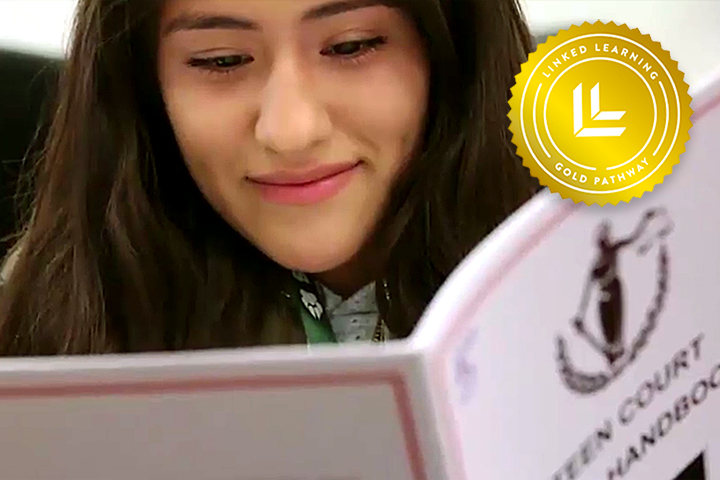 GOLD CERTIFIED – Career-based experiences for students in the award-winning Cabrillo Academy of Law and Justice include a Teen Court program that allows for interaction with professionals in the justice system.